There's a little trophy shop called Aardvark Laser Engraving down the street from our office in Oakland. It's small but bustling, and its windows are stuffed to the brim with awards made of all kinds of materials and in any shape you can imagine: chalices, orbs, golfers, gavels, apples, and plaques. Plenty of plaques. They are engraved to award the Club DJ of the Year, the newest member of a local Freemason branch, one mysterious trophy just says "Rifle Expert," and there are plenty of heartfelt engravings to spouses, family members, and retiring co-workers. Americans love trophies. Giving them, receiving them, and watching other people give and receive them. This is what makes the Oscars such popular television programming, year after year. The Oscar's "real" name was the "Academy Award of Merit," but it's now officially known by its nickname. There's a lot of mythology around where Oscar came from, but the "official" myth is that humble Academy librarian Margaret Herrick took a look at the statue and whispered "He looks a lot like my uncle Oscar!" 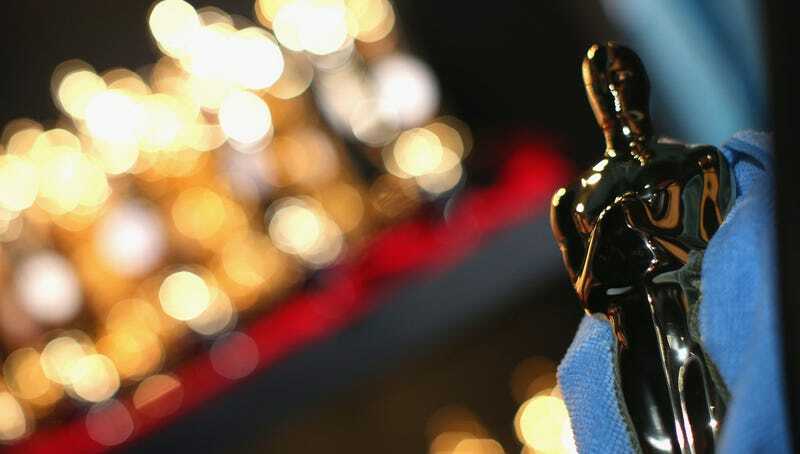 The first Oscar was awarded in 1929, and a number of different factories have manufactured the oscars over the years. R.S. Owens & Company has been making the Oscars in Chicago since 1983. It's a bona fide trophy factory, one of the last in the U.S., with big kilns for glass plaques, wheeled carts full of castings and finished pewter statuettes, and rows and rows of industrial-grade buffers. The design of the Oscar is simple. Its a stylized gold man. Actually, MGM art director Cedric Gibbons originally designed the statue as a knight gripping a crusader's sword. The Oscar only has one intricate detail—it's standing on a five-sectioned reel of film, which each section representing the 5 areas of the academy (actors, writers, directors, producers, and technicians). The Oscar, as simple as it is, has been purposefully designed to be as desirable an object as possible. There's more gold on it than in any other award by far, and all that gold is heavy and shiny. It takes about an hour to polish the 8.5 pound Oscar. There aren't hard and fast rules for making an iconic trophy, however. The Oscar, sleek and simple, is a study in contrast with the trophy for the MTV Music Video Award. The VMA is silver-cast and much more complex, featuring an astronaut in a detailed space suit, balancing on one leg. The award was designed by Pat Gorman while she was working at Manhattan design. MTV used to run a little clip at the top of the hour that featured vintage footage of the moon landing, but instead of planting an American flag, the astronaut's flag read MTV. Pat decided to turn this moon man into the video award, and she wanted to make the astronaut balance on one leg, so it would look as though it was floating. Pat drew up some sketches and sent them to a manufacturer. When she came back two weeks later, she found that the manufacturer had made an astronaut with both legs firmly planted on the ground, without an MTV flag. Also, for some reason, he was saluting. Pat was horrified, and told the manufacturer to try again and to stick to her sketch. When she came back in a week, he presented her with a statue of man who appeared to be wearing a leisure suit. He had smoothed out every wrinkle in the space suit, and he was still not on one leg. I watched a lot of Fred Astaire movies and I've done a lot of tai chi and there's a thing about balance where if you line up the head, the belly, and the foot, you can balance in almost any posture. And so I just did that. And it was perfect. The manufacturer was really strapped for time at this point, so he only got around to making five statues, even though there were about 30 awards to be given out at the ceremony. The event organizers decided that an usher could take each winner off stage and fetch the moon man each time, which meant they could just keep recycling those five awards throughout the night. This worked for a spell, until Michael Jackson messed everything up. Jackson wasn't actually present at the first VMAs in 1984, but he kept winning for Thriller. Diana Ross accepted the awards on his behalf, and because she was sitting right in the front row, she would go up and down the stairs before the usher could get the awards from her. Thriller kept winning more and more awards, until Diana Ross had several statues in her lap. An usher was sent to sneak down to Diana Ross to take the statues back. As Pat Gorman remembers it, "she starts fighting with him! …It was like a tug of war! it was a real disaster!" The moon man tug-of-war got a little bit of airtime. It was embarrassing, but history has mostly forgotten it. Much wilder things have since happened at the VMA's, and controversy has become its yearly tradition. Honestly, now that the MTV is without music, and almost without traditional television, this awards ceremony has become a big part of the channel's identity. By now, MTV has figured out how to get each winner their own, personalized awards. Which is actually a lot harder to plan than you'd think, because the manufactures don't know in advance who the winners are. In the case of the Oscars, RS Owens engraves plates for all the nominees, and the Academy can quickly screw on the nameplate of the winner and destroy the other name plates. It's a lot of effort, but it's that much more worth it for the winners to get awards that are already personalized. After all, the most important thing about an award is simply that it has your name on it. For this episode, producer Avery Trufelman spoke with Pat Gorman, designer of the MTV Moon Man, Julia Reydel, engraver and owner of Ardvark Laser Engraving, and Scott Siegel, of R.S.Owens & Company. Special thanks to Frank Olinsky and Fred Siebert for their help. *An earlier version of this web-story implied that Michael Jackson won at least five awards for Thriller at the 1984 Video Music Awards. He actually won three awards.